Poetry Friday Power Books!Click here for info about these new, awesome, student-friendly, interactive volumes! Lullaby and Kisses Sweet compiled by Lee Bennett Hopkins (Abrams). My poem "Milk" is included. The Poetry Friday Anthology for Science, K-5. (There are also grade-level student editions! Three of my poems are included in this collection. )Click here to purchase. THE ARROW FINDS ITS MARK (Roaring Brook). Two of my poems are featured in this wonderful collection edited by Georgia Heard. Love the Poetry Friday Anthology for K-5 (below) but wish there was a version for Middle School? Now there is! With more than 100 poems from 71 poets (including two poems from yours truly), this anthology will get middle school kids excited about poetry. Click here for more info. 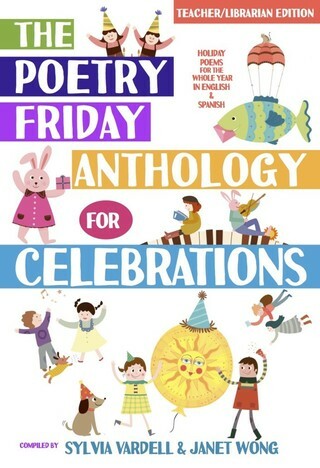 The Poetry Friday Anthology, created and compiled by Sylvia Vardell and Janet Wong, makes incorporating poetry into the K-5 routine easy and fun! I'm thrilled that two of my poems are included among the 200+ from 75 contemporary poets. Click here for more info. Click here for a great review of the Poetry Friday Anthology by the International Reading Association (now the International Literacy Association). Click here to read our Progressive Poem - each April, for Nat'l Poetry Month! - at Irene Latham's blog. Robyn's poem, "Babysitting," appears in the Feb./Mar. 2009 issue of HOPSCOTCH For Girls! Copyright Robyn Hood Black. All rights reserved. I see the ocean meet the sky. I hear the sea's eternal sigh. I feel wet sand between my toes. A fishy fragrance finds my nose. is blowing kisses in the wind. Robyn's poetry appears in Sylvia Vardell's and Janet Wong's The Poetry Friday Anthology series and first two Poetry Power Books (Pomelo Books), in Georgia Heard's anthology, The Arrow Finds Its Mark - A Book of Found Poems, (Roaring Brook Press), and in Lullaby and Kisses Sweet compiled by Lee Bennett Hopkins (Abrams), Poems are Teachers by Amy Ludwig VanDerwater (Heinemann), School People by Lee Bennett Hopkins (Wordsong, 2018) as well as a new National Geographic anthology, The Poetry of Us, by J. Patrick Lewis. Her work has been published in Ladybug, Hopscotch, Highlights Hello and in leading haiku journals and a handful of haiku anthologies. In 2016-17 she served as Southeastern Regional Coordinator for the Haiku Society of America and coordinated an Earth Day weekend workshop/meeting in April 2017. Robyn coordinated a poetry retreat with Rebecca Kai Dotlich in June 2011 and has led several haiku workshops. She'll lead a haiku-writing class for the Beaufort, SC OLLI program in November, 2018. She appeared on a poetry panel with Irene Latham and April Halprin Wayland at the Fay B. Kaigler Children's Book Festival in April 2013. In the fall of 2016, Robyn led a "Found Poem Makerspace Workshop" for dozens of fellow children's poets and the public at Village Books in Bellingham, Washington, the night before Western Washington University's Poetry Camp. Click here for the post about it on my artsyletters blog! Also, while perusing the POETRY FRIDAY ANTHOLOGIES, check out the POETRY FRIDAY FOR SCIENCE STUDENT REMIX! April Halprin Wayland, yours truly (Robyn) and Irene Latham serve up Poetry Friday Anthology poetry at the 2013 Fay B. Kaigler Children's Book Festival at USM in Hattiesburg. Publishers Weekly Children's Bookshelf Edition featured this pic and a write-up here (scroll down)! Robyn enjoyed a year of writing poetry column over at Janice Hardy's terrific blog for writers, The Other Side of the Story. (This is a site for adult writers.) Enjoy! May 2013 - You Might be Looking, but do you See? Click here to access LADYBUG'S Teacher's Guide. Click HERE to read my blog feature about this poem. The whole gang at the Highlights Founders "Poetry for All" workshop in May 2012. Woo-hoo! What a great group of poets! Here's a slithery little poem, an answer to a poetry challenge on the Miss Rumphius Effect blog. Enjoy - and watch your step! Check out these e-books from Sylvia Vardell and Janet Wong featuring contemporary chlldren's poets! Scroll down and around to read some more poetry. But first, enjoy these photos from the "Wordplay" Highlights Founders Workshop in September 2009 (led by prolifically poetic Rebecca Kai Dotlich). Rebecca Kai Dotlich, Alice Schertle, and Joy Acey have fun acting out Alice's BUTTON UP! What a thrill to meet award-winning poet and anthologist Paul B. Janeczko at the 40th Annual Conference on Children's Literature at the University of Georgia (March 2009)! "Good poetry explodes with possibilities," he says. Click here for Lee Bennett Hopkins's new website. a quiet hunger gnawing deep inside. while slowly stalking now, I must decide. surveying what she knows to be her land. mystical, magic words my deepest need. A hunter with her prey? I'm not so free. This poetry I bought - it now owns me. Rebecca Kai Dotlich came to the Voices in Children's Literature conference in Georgia in late 2007, and I took every workshop she offered! Her Highlights Founders Worskhop in Sept. 2009 was terrific as well, and I joined her again there for "Poetry for All" in 2012. I also brought her to Georgia for an SCBWI Southern Breeze retreat in 2011! Explore her love for lyrical language in her many books and her poems in anthologies.